Prelude to a crisis: Why the rush to include China’s currency in the SDR? Discouraging meat eating for a better climate? Gold breaks support… big numbers tomorrow and Friday… The 5 is buttered up without the usual “but”… and more! Allow us to be the first to wish you Happy China SDR Day. Around lunchtime in Washington, the International Monetary Fund voted to admit the Chinese yuan to the special drawing right — the IMF’s “world money,” an exclusive club heretofore limited to the U.S. dollar, the euro, the British pound and the Japanese yen. We daresay the news wouldn’t be getting as much attention as it is were it not for the efforts of our own Jim Rickards to spotlight the SDR, starting with his 2011 book Currency Wars. But most of the elite media coverage is dry as dust. Yes, there are snappy headlines about “putting the yuan on a par with the dollar,” but the stories below the headlines are boring policy-and-procedure stuff. Reading it, you’d be forgiven for thinking the vote has little relevance to your life. Make no mistake: Your financial future depends on it. And Jim Rickards has identified a way to “own the SDR” and preserve your wealth during the coming global monetary shake-up. We hasten to add: We’re not talking about a trading strategy or anything that will entail a big outlay of funds for you to learn about. This is a simple, accessible, “one click” method that readers of Jim’s entry-level newsletter Strategic Intelligence learned about 10 days ago. 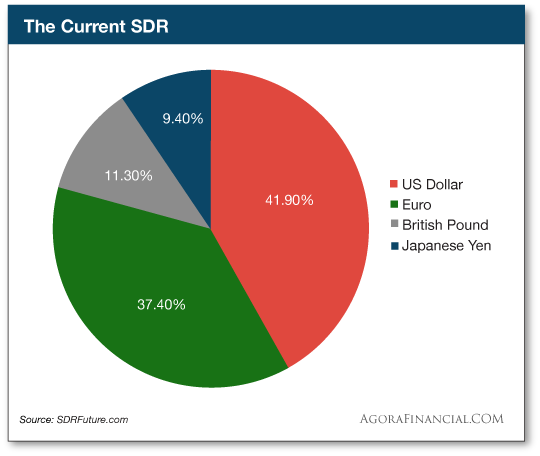 First, a quick reminder of what the SDR is: It is a kind of super money printed by the IMF and circulated among central banks and governments. It’s during the next such crisis of confidence — whenever it occurs, for whatever reason — that Jim believes the SDR will become the currency of choice among global elites. “The next panic will be bigger than the central banks’ ability to put out the fire,” Jim explains. “The only source of bailout cash will be the SDR. But a massive issuance of SDRs will require cooperation by China. “The rush to include China in the SDR should be seen as global monetary elites getting their ducks in a row before the next panic comes to destroy your portfolio.” When that panic arrives, the IMF will issue trillions of SDRs… and China will proceed to dump its dollars for SDRs, an act it would not perform unless the SDR includes the yuan. That is, you and I will still use dollars. But they’ll no longer be the world’s go-to currency. That will be the SDR’s function in the aftermath of the next crisis. And your dollars will be worth far less than they are now. Today’s decision is setting off a global monetary scramble. The yuan’s inclusion doesn’t become official until Oct. 1, 2016. That leaves ten months for the world’s most deep-pocketed investors — for instance, the $1 trillion sovereign wealth funds of Norway and Abu Dhabi – to reshuffle their portfolio positions. 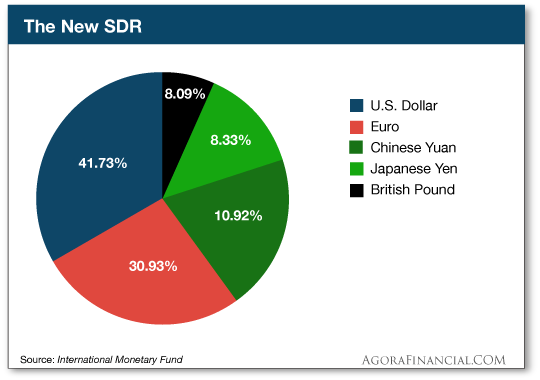 They’ll aim to build portfolios denominated in currencies that match the SDR’s new composition. Which is swell for Norway and Abu Dhabi… but what about you? Believe it or not, you can invest right alongside them… and you don’t need anywhere near their resources, either. With the yuan going from zero to nearly 11%, yuan-denominated bonds will be in high demand. And more than half of the yuan’s gain is the euro’s loss. “This is not the first time you could have gained from an SDR rebalancing,” Jim says. But what about now — when the shift in the SDR has many more moving parts? Fact is, you can invest accordingly — even if you don’t have $1 trillion or anywhere near it. In fact, you can get started with as little as $250 using the method Jim advises. He revealed it on Nov. 20 in a massive double issue of Jim Rickards’ Strategic Intelligence. You can act on his recommendations today and invest alongside the world’s most connected investors. Start here. To the markets… where the major U.S. stock indexes are in the red, but not dramatically. At last check, the S&P 500 was off four points, at 2,085. Bonds are rallying, sending yields down. The yield on a 10-year note sits at 2.22%. Gold got slammed in electronic trading on Friday morning, only minutes before the open of floor trading. This morning, it’s recovered a bit, to $1,063… but support at $1,068 is now history. Crude is knocking on the door of $42. No big economic numbers today. But tomorrow brings us manufacturing numbers from around the world. And Friday is the jobs report that might prove the final word on whether the Federal Reserve will start walking away from seven years of near-zero interest rates when it next meets, on Dec. 16. “Global warming study — meat to be taxed like cigarettes,” says the subject line of an email from a reader. With the big “climate conference” underway in Paris today, one of our regulars sends us a Breitbart story: “Tackling climate change and improving public health can be achieved by forcing consumers to eat less meat in their diets, and it is up to government to force that change, finds a new report. Here’s the funny thing: If you take livestock outside the modern industrialized feedlot, they do wonders to limit carbon. “Cattle are powerful carbon-fixers,” wrote Brad Lemley last February in the Laissez Faire Letter. “Each time a cow takes a step, its sharp hooves push grass — which is primarily made of carbon pulled from the atmosphere — into the soil. Cattle manure does the same thing. In other words, via two mechanisms, cattle ‘fix’ free carbon, a greenhouse gas, in the Earth’s crust. But of course, it’s not about carbon, or even about climate. It’s about control. “Let me tell you what the most dangerous policy action in the world is,” wrote former investment banker and government official Catherine Austin Fitts last year. And, we should add, clamp down on dissent. 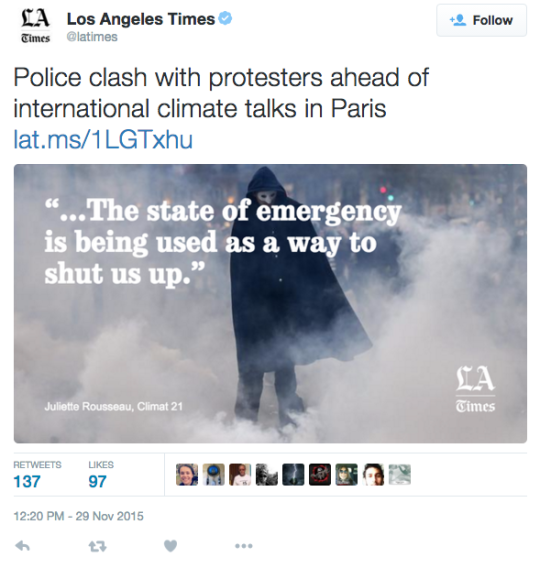 The Paris climate conference was planned long before ISIS sympathizers carried out the shootings and bombings in Paris on Nov. 13. But the French government used the attacks as an excuse to ban public protests — including two big demonstrations intended to bookend the conference. Understand we’re talking about people who think the assembled government leaders in Paris aren’t doing enough to combat climate change. “Everything you write about is so relevant and insightful, it is always a pleasure to read The 5,” says our final item of reader mail today. “I get so many emails from financial markets and advisers, but The 5 is far and away my favorite. You have humor and yet tell it like it is. The 5: Where’s the “but”? P.S. As we put a bow on this episode of The 5, we see the IMF has indeed signed off on the Chinese yuan joining the SDR. Which will happen whenever the next financial crisis starts to snowball. Are you ready?